Last Friday evening, I went searching for Frank Lenz, one of Pittsburgh’s most notable cyclists. To be fair, Lenz went missing almost 120 years ago, in Erzurum, Turkey, so I really didn’t have much hope of finding anything, but I figured I’d give it a shot. I headed over to the Brew House Art Gallery on the South Side, where David Herlihy, the author of The Lost Cyclist: The Epic Tale of an American Adventurer and His Mysterious Disappearance, was slated to give a talk about Lenz’s journey by bicycle around the world, his disappearance, and the adventures of William Sachtleben, another cyclist who had ridden around the world, and who was sent to find Lenz. Prior to Herlihy’s talk, I had not heard of Lenz or Sachtleben, but a worldwide cycling tour intrigued me, and plus, who doesn’t liked those old-timey, big-wheeled bikes? Lenz was apparently a big fan. Born in Philadelphia, he moved to Pittsburgh and became an accountant by day, and a weekend warrior who captained the Allegheny Cycle Club. He organized and competed in his fair share of big-wheeled bike races, and pioneered the burgeoning field of cycle photography—an impressive feat, considering that cameras were just as cumbersome as bicycles at the time. Lenz developed a way to transport camera equipment on his back while riding, as well as a method of taking pictures of himself on his bicycle, by placing a trigger on the road, which would activate a camera on a leading car when his front tire (the big one) rolled over it. 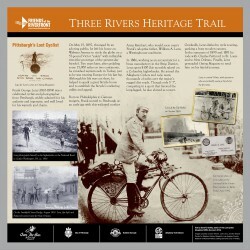 Today, Lenz is commemorated with a sign on the Three Rivers Heritage Trail, the final leg of the Great Allegheny Passage, which connects Pittsburgh with Cumberland, Maryland, and which mirrors the path that Lenz took on the first leg of his now legendary trip around the world.